In 1960's there was wide spread opinion among military specialists that military jets have to be able to fly on soft-surface runways during war conflicts. Because main (concrete) runways could be easily put out of operation by the enemy strikes. This idea influenced on new variant of the wide-spread Sukhoi Su-7B fighter-bomber — Su-7BKL (NATO-code «Fitter»). First prototype of this modification performed its maiden flight in 1962. 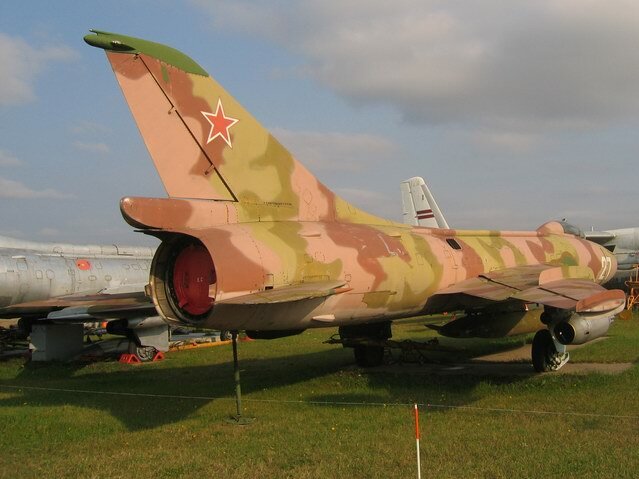 In Su-7BKL was invented new wheels-and-ski landing gear, gunpowder accelerators, two-canopy breaking parachute, increased amount (six) of weapons pylons, upgraded bombsight. New gears were adopted for taxiing, take-off and landing on soft-surface aerodromes. Front gear received tyre with increased diameter and on main landing gear were installed small steel skis, together with wheels. During take-off or landing on hard surface were not working due to their suspension, not allowing to touch the runway. But they started to work when wheel became to deepen into soft soil. Skis helped to distribute pressure and not allowed wheels to get deeper and to brake aircraft movement. Komsomolsk-na-Amure Aviation Factory started to produce new upgraded variant in 1965 and finished in 1972. At the same time another Su-7B variants were produced — Su7BM/BMK/UM and UMK. 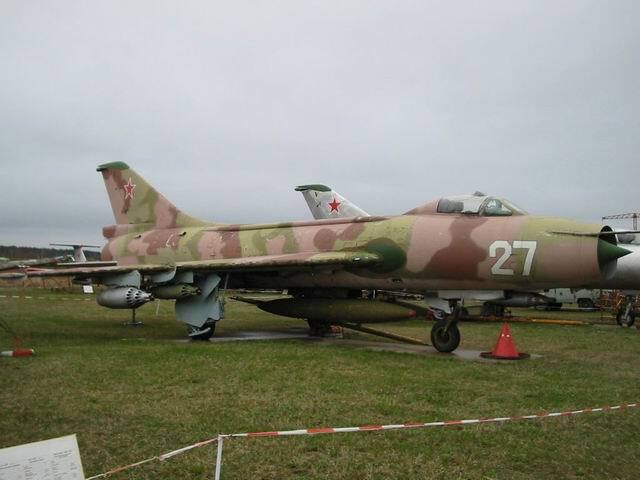 Su-7BKL's were used by Soviet, Polish and Afghanistan Air Forces. Afghanistan widely used another variant — Su-7BMK, but due to high combat losses and lack of spare parts, small amount of BKL's were exported to there in 1980's. At the end of 1960's Su-7B and its variants were upgraded with electronic countermeasures pods to confuse planned rival's air defence. On the right underwing pylon was attached SPS-141 (142, 143) system pod. This ECM system provided less probability the aircraft to be shot down. On the opposite side usually was attached UB-16-57 pod with unguided rockets. Our Museum has Su-7BKL serialled 27-white (production number 5710) which was given by Riga Suvorov school in the middle of 1980's.